Let’s do lunch ! | La Rosilla - Lifestyle and food. One of the joys about living in Spain is the tradition of ‘menu del dia’ – menu of the day, that all restaurants should offer to diners. The long leisurely lunch is a way of life that I have been happy to adapt to, not possible every day but on days that it is , I’m there ! Many bars and restaurants are full to bursting at 2pm each day, with workers taking time out, to eat, chat and relax with one another before they start their afternoons working activities. Popular eateries, can turn around hundreds of diners during this time, all enjoying 3 courses, bread, wine & water for a token price from 7 euros. I have my favourites and depending on whether I’m just looking to refuel with honest good grub, or sit soak up the sun, or enjoy that something just a little bit more special, ‘Menu del dia’ can tick most boxes. I was delighted to hear through the grapevine that one of my favourite places Tanit in Torre del Mar, was expanding their empire. Their promenade restaurant paved the way for new hip places in Torre del mar, they then opened the wonderful Bahia del Tanit beach club, which I, along with many friends and family frequent in Summer as much as possible, making the day at the beach a little more lovely. 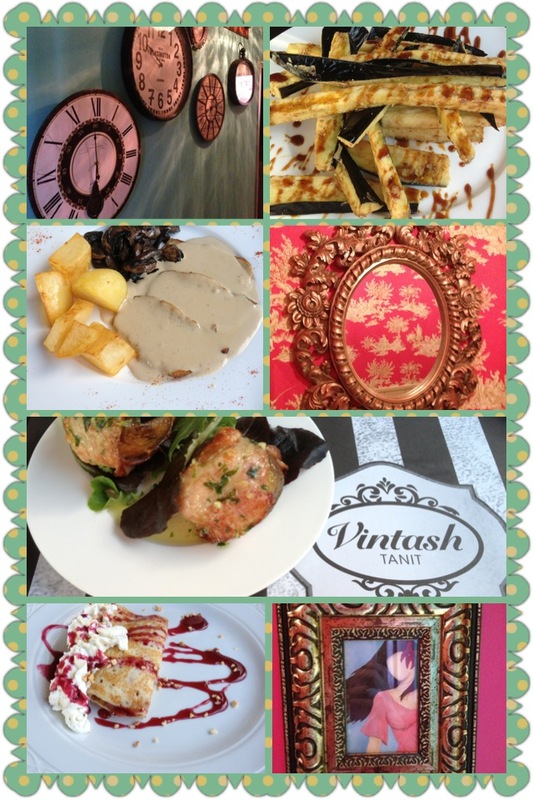 Their newest venture Vintash Tanit, is located in town on the Avenida Andalucia. So that was it, after weeks of trying to get there, my OH and I decided to have our works Christmas ‘Do’ albeit after Christmas, and just the two of us 😉 and Vintash Tanit was the place to go. We were not disappointed, the Tanit style was evident with their eclectic mix of furniture a shabby chic & boudoir interior, right up my street. Staff attentive and welcoming like normal. We indulged in to start, two sharing platters of mushrooms, stuffed with Roquefort & wrapped in bacon, and delicious berenjenas fritas (fried aubergine) served in modern baton style. Chicken Caesar Salad, Pork, saute of mushrooms and cream sauce, followed by crepes & strawberries.